You will be given a reference e-book to read which has 435 pages And the test will be based on that e-book , you can take final test within 1 year of purchase. Google Adwords is popular for being the main advertising product of Google and its main source of revenue. It is known as a popular keyword advertising system wherein certain ads are viewed as sponsored links not only on the result pages of Google but also on the results pages of its partners like Ask.com and AOL. If you are an advertiser, then you will have to select keywords and short text ad which comes with either one or two lines in order for it to appear on the results pages once your ad keywords correspond with the keywords that are being searched. The specific order of the ads is actually determined by numerous factors. The first one is the specific amount which an advertiser commits to pay Google whenever a user clicks on his ads. Other factors that determine the order of the ads are the relevance to the searched keywords, historical click-through rates of ads and the landing page’s load time. Google Adwords also refers to the program which is offered by Google which pays various websites using the pay-per-click method. The ads that are usually used in the program are text and banner ads that are capable of showing contents linked to the offers of a site. The extreme popularity of the Google Adwords program at present can actually be attributed to the low start-up costs needed and the huge amount of profit that a site owner may generate in the future. If you are one of those who wish to completely understand how Google Adwords works, then the Google Adwords certification course from Brainmeasures is extremely beneficial for you. The Google Adwords course offered by Brainmeasures aims to provide relevant information about the Google Adwords program while also letting you fully understand all the terms and concepts linked to it. What makes this online certification course amazing is the fact that Brainmeasures operates through the stringent standards set by ISO and this gives you the guarantee that whatever information that you will get from it is one hundred percent accurate. With the help of this Google Adwords certification course, you will no longer find it hard to carry out all your online marketing campaigns through Adwords. It should also be noted that the program comes with an online advertising test designed to evaluate your level of knowledge about Adwords and your worthiness to become a recipient of the certificate. It is important for you to commit yourself towards passing the Google Adwords exam as this is the only way for you to become certified. 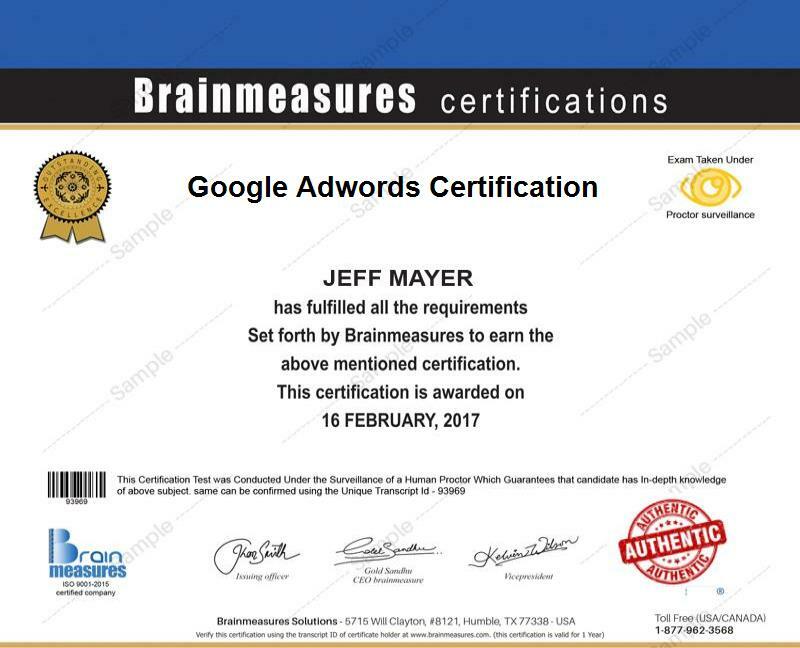 The Google Adwords certification program offered by Brainmeasures is extremely beneficial to different types of individuals. This certification course is perfect for those whose responsibilities in a company involve carrying out online advertising campaigns. This can also help you out if you are someone who wishes to establish your own home based business dedicated to advertisement management. The Google Adwords certification course is also beneficial for PPC specialists and independent consultants. Certified Google Adwords experts can expect to earn a substantial amount of income just by offering their services to anyone who is interested. Aside from your regular pay, you can also expect to earn bonuses after you take a hold of your Google Adwords certification and a business organization hires you. You may also decide to work part-time to further increase your regular income. According to Indeed.com, Google Adwords certification holders can enjoy an average annual salary of $87,000.